David Beckham has a misspelled tattoo in Hindi script of his wife, Victoria's name tattooed on his left arm. It reads "Vihctoria." The woman who had "no regerts" tattooed on her arm was forced to confess that she now had one, while the man with "Jenius" inked on his forehead soon had others begging to differ. 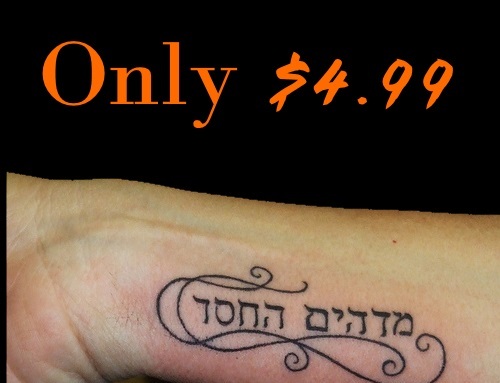 These were just two of the examples of poor spelling by tattoo artists that should have all of us heeding the warning to "think before you ink." At a time when body art has never been so popular, cases of carelessness among customers are all too common, said Veritas Language Solutions, an international translation and language service provider based in the U.K., which recently claimed that poorly translated foreign words or phrases were a particular problem. It gave one example of a man who wanted the Chinese symbols for "Live and let live" on his arm, but ended up with the Mandarin for "Sweet and sour chicken." In another example, a woman who wanted her favourite flower name written across her lower back was left with the words "Sweet Pee" above her waistline. Sharon Stephens, the managing director of the translation service, said: "Tattoo translations are in demand and we regularly get requests for Chinese, Arabic and Hebrew and, now and again, Gaelic. on the receiving end of the needle." But she warned: "There are some hilarious examples of translation errors out there." Problems often arise when literal translations are used instead of finding out the equivalent word or phrase in the foreign language. Among the most famous body-ink fans to fall foul of such an error is David Beckham, who reportedly decided to have his wife Victoria's name tattooed on his left arm in Hindi script because he felt it would look less "tacky" than having it done in English. Unfortunately, an extra "h" was added into Victoria's name, leaving the word "Vihctoria" branded on his skin.